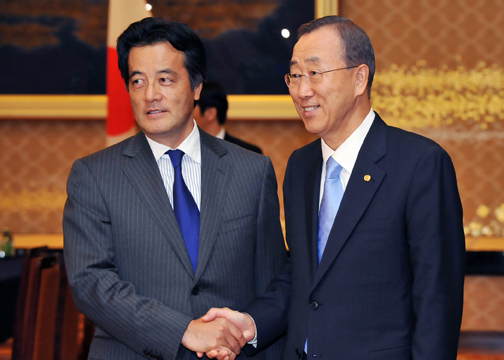 On August 3 (Tue) from 7:15 p.m. for around two hours, Mr. Katsuya Okada, Minister for Foreign Affairs of Japan, held talks and a working dinner at Iikura House with Mr. Ban Ki-Moon, Secretary-General of the United Nations. The overview of the meeting is as follows. A press conference was held following the meeting. At the beginning of the meeting, Foreign Minister Okada welcomed Secretary-General Ban’s participation in the Hiroshima Peace Memorial Ceremony as the first Secretary-General of the United Nations to attend the ceremony, as well as his visit to Nagasaki. Secretary-General Ban stated that he was happy to be able to visit Japan and that in particular, with this year being the 65th anniversary of the dropping of the atomic bombs, being able to visit Nagasaki and attend the Hiroshima Peace Memorial Ceremony was an honor. On the topics of nuclear non-proliferation and disarmament, Foreign Minister Okada stated that Japan has an intention, in cooperation with Australia, to hold a foreign ministerial meeting on nuclear non-proliferation and disarmament, making use of the opportunity presented by the United Nations General Assembly in September. In response, Secretary-General Ban noted that the threat of nuclear weapons was real, and that with the hope of sending a strong message to the international community about the realization of a world free of nuclear weapons, a high-level meeting of the Conference on Disarmament was planned for September. In regard to North Korean issues, Foreign Minister Okada underlined the need for North Korea to take the Statement of the President of the UN Security Council seriously and to take forward-thinking and concrete actions to resolve the nuclear problem. Secretary-General Ban stated that he was strongly concerned about the issues of the Korean Peninsula, and that as the Secretary-General of the United Nations he hoped to make every possible effort to further discussions with North Korea. The two leaders shared recognition of the need for the early realization of UN Security Council reform. Foreign Minister Okada requested the continuing understanding and cooperation of Secretary-General Ban in promoting discussion on the issue. Foreign Minister Okada explained Japan’s initiatives for peacekeeping operations (PKO) and peacebuilding, and in response Secretary-General Ban expressed his appreciation for Japan’s contribution and leadership in these areas, including Japan’s swift dispatch of Self-Defense Force (SDF) personnel for PKO in Haiti. 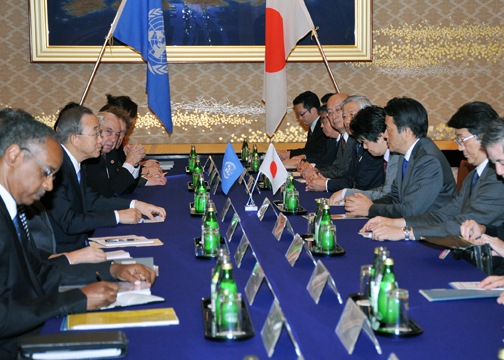 In addition, Foreign Minister Okada and Secretary-General Ban also had a wide-ranging exchange of opinions on global issues such as the Millennium Development Goals (MGDs), climate change, biodiversity and other related issues, and regional issues such as Afghanistan, Sri Lanka, and Myanmar.